Let’s be real: the holidays are wonderful, but they can also be stressful. You’ve got family to host, gifts to buy, meals to make, work to do, cleaning to finish…the to-do list is never-ending! That’s why I love homemade bath bombs. They’re fun and relaxing–not to mention a very frugal way to treat yourself and the ones you love. (I’d recommend making one for yourself as well as a few others for gifts!) 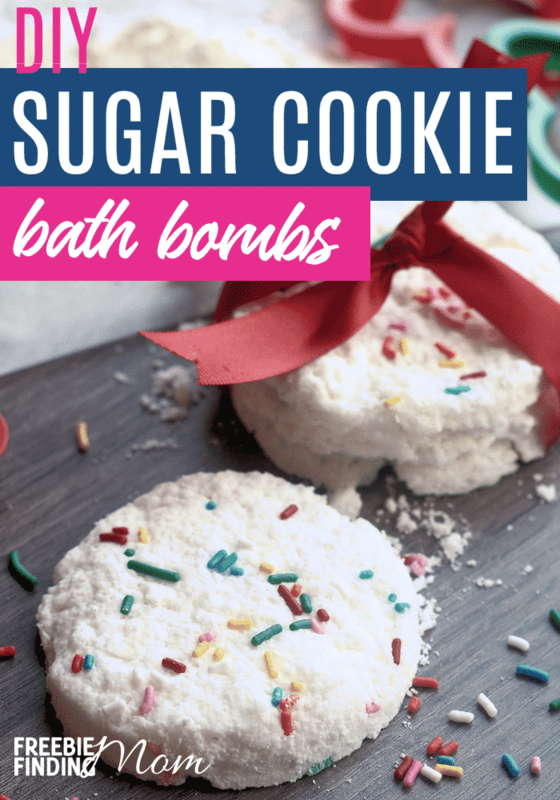 Kids will love playing in a bath with this DIY surprise bath bomb, and adults will enjoy soaking in this homemade peppermint bath bomb or homemade bath fizzies. This bath bomb DIY is so easy, quick, and inexpensive to make, there’s really no good reason not to do it! You don’t even need an oven or microwave–just one mixing bowl and a little bit of time. Without further ado, let’s get in to the recipe (below)! Note***Please use your best judgement when giving to children: they should not be ingested and are just meant to be a fun whimsical copy of a holiday favorite. 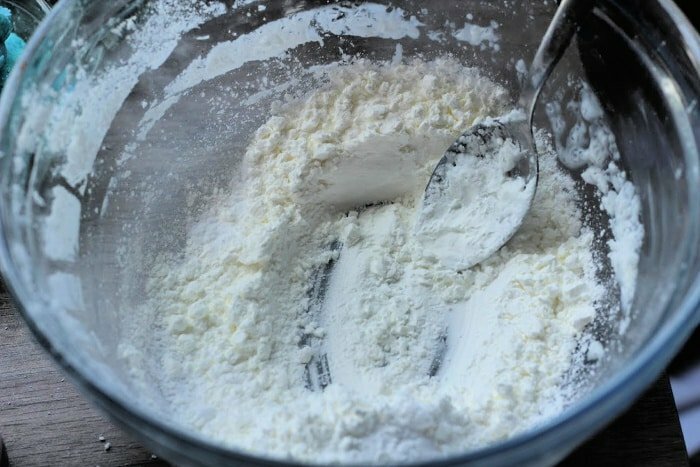 1.Combine all your dry ingredients in a large mixing bowl and mix well. 2. Next, stir together the coconut oil and extracts. Add the extracts to the dry mixture a little at a time, stirring as you go. 3. Spritz mixture with water just until it holds a bit of shape when squeezed in your hands. 4. Lay out a piece of waxed paper on a flat surface and press out the mixture onto it to about ¼” – ½” thickness. 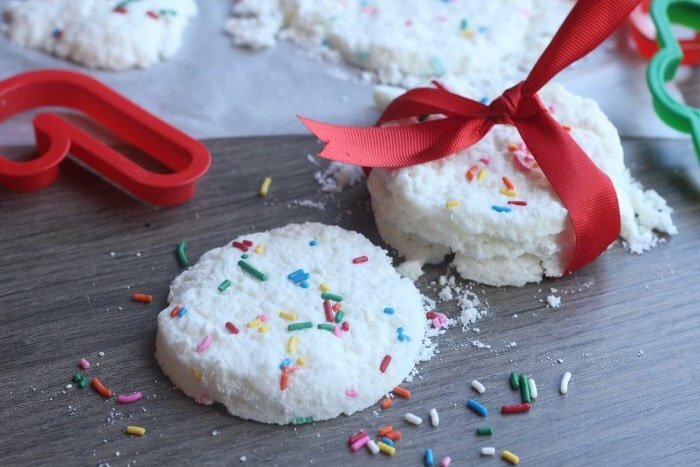 Sprinkle generously with baking sprinkles and press in with your fingers. 6. Allow your “cookies” to dry completely. They are best left overnight. 7. Carefully remove from wax paper and wrap them in plastic wrap and a ribbon or tuck them in a pretty jar. How many cookie bath bombs you are able to make will depend on the size of your cutters and your thickness. My bowl was about 3” wide and made about a dozen. 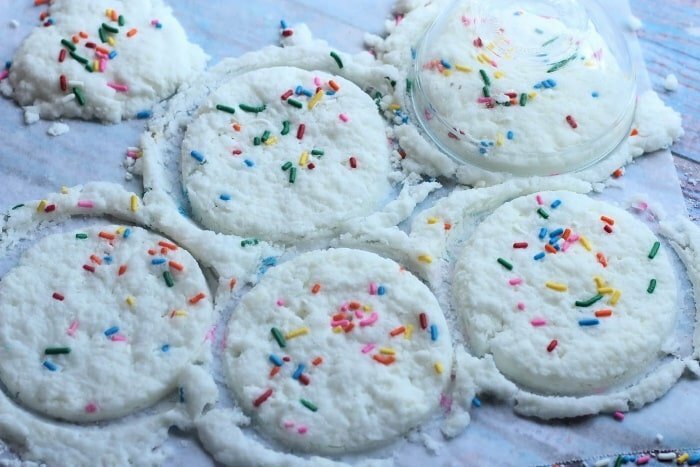 How easy was that homemade bath bomb recipe? I hope you get to use your new DIY bath bomb to unwind in a long, indulgent bath very soon! If you’re looking for more DIY, make sure to follow Freebie Finding Mom on Pinterest! You can find the best recipes on the DIY fun, homemade beauty products, and DIY beauty Pinterest boards.